Our starting point - a garden created when the home was built but not fully suited to the needs of those with dementias. Watch this space! Exciting news .... we won! Grow Places – Growing Together at Field Lodge Care Home bid to bag a massive cash boost from the Tesco Bags of Help initiative. The supermarket teamed up with Groundwork on its Bags of Help initiative, which saw grants of £12,000, £10,000 and £8,000 – all raised from the 5p bag levy – being awarded to environmental and greenspace projects. Grow Places – Growing Together at Field Lodge Care Home was one of three groups on the shortlist. And we were awarded the maximum of £12,000. This will provide a wheelchair accessible greenhouse, raised planting beds, compost heaps and wheelchair-accessible paths. Work has already begun thanks to Ann, Field Lodge's amazing new gardener and a member of their care staff too - the perfect link to encourage residents to use the garden more. She's pictured here on Field Lodge's new allotment - the gardening and growing bug has really bitten! Grow Places is working with Field Lodge Care Home in St Ives, Cambridgeshire to develop their gardens for the benefit of all residents, many of whom have had to leave behind their own loved gardens. The garden is already opened to the public for events in the summer. We hope to increase opportunities for the local communities to get involved with the creation and maintenance of the new garden, and benefit from the residents' life-learned gardening skills. 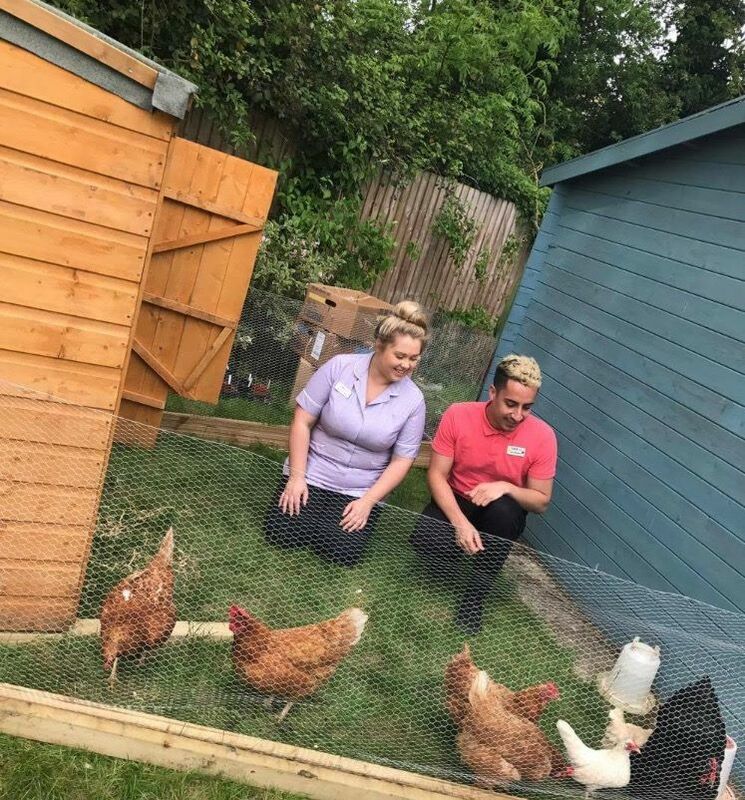 Field Lodge is particularly keen to involve the outside world in the day to day life of the care home and as part of this we hope to involve school groups and groups of volunteer gardeners to help maintain the gardens and learn alongside the residents. If you would like to get involved, please get in touch. And look who's appeared in the Home's garden now - chickens!